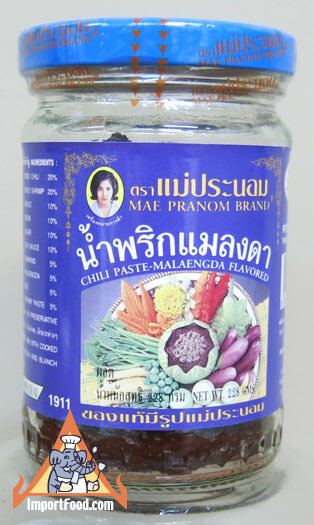 Brand new product from premium producer Mae Pranom. Mangda, also spelled Maengda, is a very popular flavor among people throughout Thailand. One would be surprised that the unique flavor comes from a waterbeetle (the mangda). Markets in Thailand sell mangda by the kilogram with their legs neatly tied. They're pounded in a mortar and pestle to make the chile paste, also known as namprik. Ingredients: dried chili, dried shrimp, garlic, onion, sugar, fish sauce, tamarind, maengda, salt, shrimp paste.